« Ticket Info for WLW Night of Champions 3 W/ Harley Race, Arn Anderson, Jimmy Hart, Scott Steiner, JJ Dillon and Bob Orton Jr. This entry was posted on February 4, 2018 at 8:13 pm	and is filed under Uncategorized. 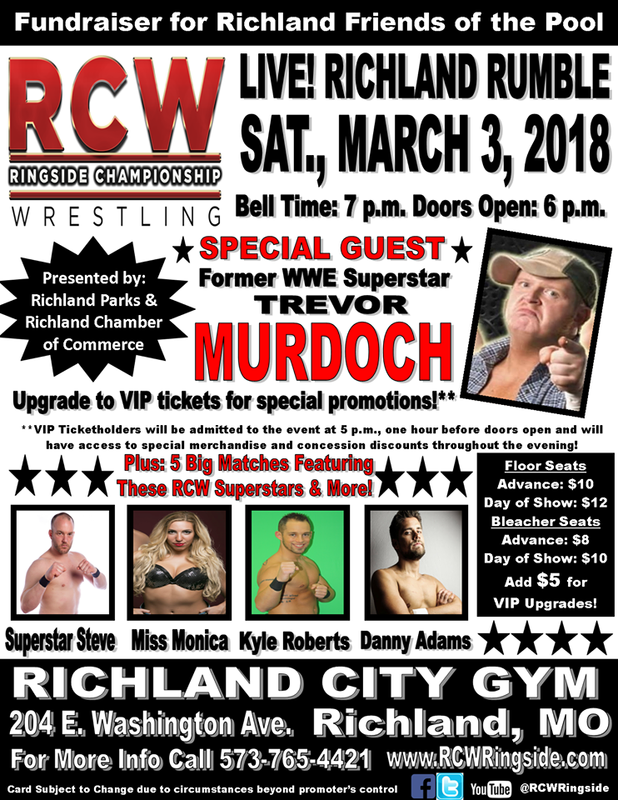 Tagged: Danny Adams, Kyle Roberts, Miss Monica, Missouri on March 3rd Trevor Murdoch, RCW, RCW Comes to Richland, Ringside Championship Wrestling, Steve Fender, Trevor Murdoch. You can follow any responses to this entry through the RSS 2.0 feed. You can leave a response, or trackback from your own site.